ALPINE, Calif., November 8, 2017 (Newswire.com) – ​Sheldon “The Showstopper” Creed, announced today that he will return to MDM Motorsports to race the full 2018 ARCA Racing Series presented by Menards schedule, with the intention of bringing home the championship. Creed, who turned 20 in September, had won at least one championship every year since 2008, but that was not possible this year, since he didn’t race full-time in any series. 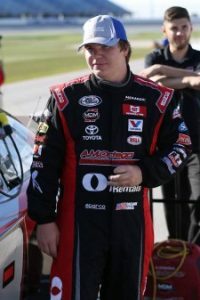 Instead, to build his stock car racing experience, he competed in 24 select races in 6 different series, including ARCA, the NASCAR K&N Pro Series East and West, Camping World Truck Series, Xfinity Series, and the Trans Am Series. In addition, he was able to return to the Stadium Super Trucks series, where he was the 2015 and 2016 champion, for non-conflicting events. In 11 SST races on five race weekends, he took five wins and two 2nd places. In 11 ARCA Series starts this season, Creed scored five top-five finishes and eight top-10 finishes, as well as a General Tire Pole Award at Kentucky Speedway. In the final ARCA race of the season at Kansas Speedway, Creed dominated, starting second and leading the most laps (52), before making contact with another car during a late race restart and cutting a tire, relegating him to a 19th place finish. Another dominant performance by Creed came in the Trans Am Series at Road America in August, where he advanced from a 12th place start to take the lead and win by over nine seconds in torrential rain. Later that same day, on a dry track, Creed’s second career NASCAR Xfinity Series start would see him start from 40th place (for missing the driver’s parade), but race all the way up to 10th place by the end of Stage 1. Unfortunately, a transmission problem would see him leave the race early with a mechanical DNF, but he had made a big impression. Sheldon Creed, nicknamed “The Showstopper” began racing BMX at age three and won two motocross championships at age six. He has won at least one championship every year since 2008. *In 35 races, had 27 top-10s, 19 top-fives, and six wins.